Cash For Clunkers, also called CARS (Car Allowance Rebate System) might be the most outrageous use of taxpayer funds ever. -->>"Qualified consumers will receive a credit of $3,500 or $4,500 for an eligible trade-in toward the purchase or lease of an approved vehicle under CARS Program." And then the incredible part. 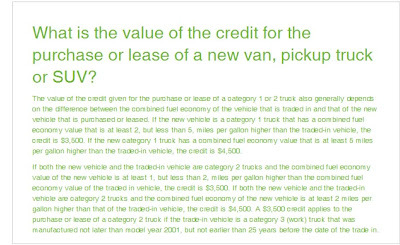 If you are buying a "category 2" truck, you bank $ for an increase of ONE mile-per-gallon. Is it even good for the environment? NO WAY. We're subsidizing the environmentally "unfriendly" creation of a new automobile, instead of the purchase of a used one. All for an increase of one mile per gallon. AlphaNinja - Market up then down then up today, not much conviction. Rampant speculation today about the positives of a "slowing" GDP decrease that was reported. Maybe it's slowing but it's still a decrease. AlphaNinja - Futures are pointing to a lower open for US stocks after a GDP report showed a lower than expected 1% decline for the second quarter, but revised the first quarter lower to -6.4%. "When the endowment chief of the University of Colorado joined boutique Wall Street firm Perella Weinberg Partners earlier this month, he didn't show up empty-handed: The school's entire $825 million endowment came with him. The transfer is unusual for two reasons, say money-management experts. The foundation that runs the endowment didn't seek competing bids. And few endowments of its size have outsourced 100% of their assets." White roofs, to help the environment and save on electricity bills. The unfortunate real estate that remains after an auto plant closure. 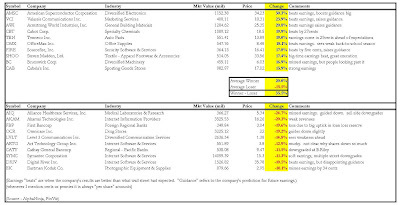 AlphaNinja - Steven Madden (SHOO) reported earnings of 66cents per share, versus the 49cents expected by Wall Street. 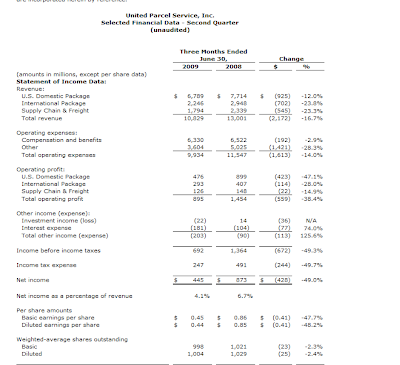 Accounting for 81% of revenue, wholesale sales were up 11%. Retail (company-owned stores) declined slightly, due to the closure of two locations and a drop in same-store-sales of 5.4%. SHOO guided earnings for the full year to about $2.07 per share, well above the current consensus of 1.89 and still above the street-high 1.93. -The company expects to open 1 new store during the remainder of this year while closing 2. -The improvement in gross margin was due to a 200basis point (2%) improvement in the wholesale division. -As for how to deploy the company's $111million in cash and securities, they're "actively" looking at 3 acquisition targets, but nothing is imminent. -Looking forward they see continued year-over-year improvement in wholesale gross margin, yet continued weakness at retail. -As for how to improve retail performance, the two main factors are the closure of underporfming locations, and an improving retail environment. -->> The NYC locations, while expected to be terrific performers over the long term, are a huge short-term drag on costs. Netting out $6 per share in cash, the stock trades at a PE multiple of 13times the new EPS guidance. The possibility of more positive earnings surprises is likely, given this company's history. Wedbush upped their target to $38 today, and took fiscal 2010 estimates to $2.34, as they see the brand gaining market share. AlphaNinja - Well this more like the "speech" of the day. An oldie but a goodie. Had California listened to this woman back in 2008, might we have avoided the budget meltdown? AlphaNinja - US stocks are racing ahead (down off their highs for the day though). 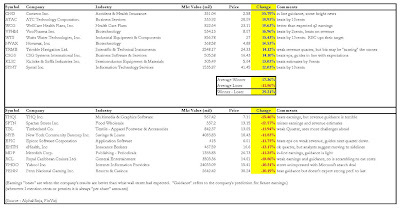 There were a decent amount of earnings beats this morning and last night, and those comapanies who missed earnings expectations are being met with "kinder" reactions than a quarter ago, as investors look ahead to a potential recovery. AlphaNinja - Oil has rallied massively off its lows earlier this year, and some see a pullback in order. Aaron Task has a great interview with James Cordier of Liberty Trading, who is making bearish (negative) bets on near-term oil prices, as well as longer-term negative bets on natural gas. "A fair price for oil is probably $40-$60, and that's only a best guess. In 1998, with oil at $10, the world used about 74million barrels per day. We now use about 84million barrels, an increase of 14%. 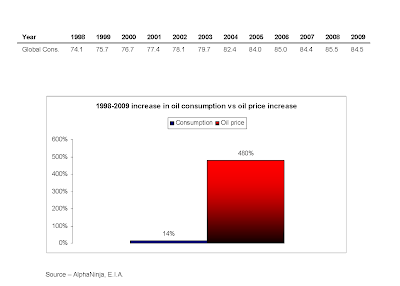 Yet the per-barrel price is up 480% - 34 times as much as the underlying consumption." AlphaNinja - US futures look to have an up day after losses the past few sessions. Positive comments by Goldman about General Electric(GE) are boosting shares 6% in early trading. Which auto companies will thrive when the industry makes a comeback? Return to glory for the once-bestselling Taurus? Deal with Yahoo may signal a tide shift at Microsoft. In a good way. Yesterday's treasury debt sale saw weak demand, not a good sign. AlphaNinja - Taken private in the summer of 2007, Dollar General may make a return to the public markets soon. It's a standout winner among KKR's portfolio right now, so it's critical that this IPO is executed flawlessly. "Kohlberg Kravis Roberts & Co. is in advanced preparations for an initial public offering of stock in Dollar General Corp., said people familiar with the matter, as the private-equity firm aims to solidify its reputation ahead of its own trip to the public markets." Dollar General has become one of KKR's best-performing assets amid the down economy. For the quarter ended May 1, its profit surged to $83 million from $5.9 million a year earlier. While most retailers are retrenching, Dollar General is planning to raise its store count by 450 this year from 8,362 locations at the end of 2008. The Goodlettsville, Tenn., company's gross margins rose to 30.8% from 28.8%. When KKR first bought Dollar General for $7 billion, it valued the equity at $2.8 billion, using debt to pay for the rest. Assuming the company can attract the same market values as Wal-Mart and other successful retailers, that equity stake could be worth about $3.7 billion today, meaning KKR would have increased its investment about a third. AlphaNinja - Last night, disk drive maker Western Digital (WDC) blew away the street estimate for 4th quarter earnings, reporting 76cents per share in profits versus an expectation of 28cents. In a "where do we go from here" reaction, the market is sending shares down about 2.5% to $30 -- God help WDC if they MISS an quarter. 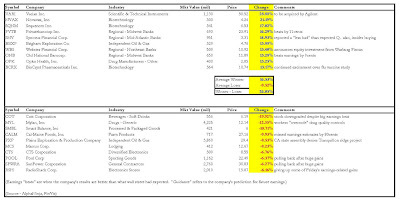 -->>On the conference call, they guided earnings for the upcoming quarter to a range of 75-82cents, versus the current street consensus of 48cents. Impressively, that's even above the street-high estimate of 74cents. -->>Baird drops its rating to Neutral from Outperform, yet increases the target price to $34 from $26. Sooooo, yesterday the stock was an Outperform while trading $5 above the target price, yet today it's a Neutral despite being $4 below the new target? -->>Collins Stewart noted that HDD(Hard Disk Drive) unit shipments outgrew the market, yet an extra week in the quarter inflated that. They worry that the stock is currently trading at a peak multiple on peak earnings, and would be more interested should the shares drop to the mid-20's. -->>AmTech focused on the industry dynamics, noting positively that competitor Seagate has tempered Capex (Capital Expenditures) plans, meaning supply should stay in check and pricing may hold up well. 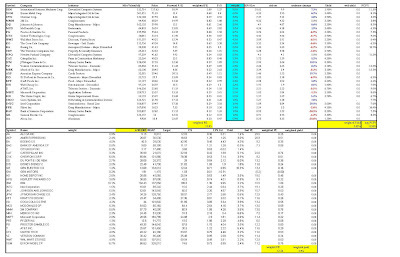 WDC management is fantastic (their quick responses to market conditions often result in industry-leading factory utilization rates), yet on conference calls they still pray for "industry participants" to focus on profitability -->> to some degree, the company is always at the mercy of others in the industry increasing supply to the detriment of pricing. 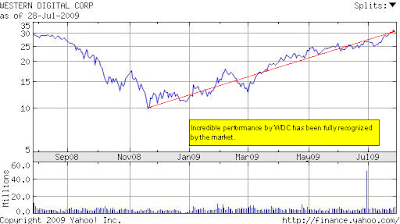 Western Digital shares are up huge since I first picked them up back in November (I do not own them now). The FCFY (Free Cash Flow Yield) was in the high 20% range when the stock traded in the low teens, and now it looks to be between 10-15% depending on next year's earnings. For me that yield is not enough to be involved in this name, because of the incredible volatility in the sector. White House details on agency cost-cuts - a good start. AlphaNinja - The White House previously asked agencies to come up with about $100million in savings. They were ridiculed for the insignificance of such an amount, but the details outlined below can serve as a blueprint for cutting costs everywhere in government. Gotta start somewhere, and maybe agencies will see these little improvements and take them further..... Unnecessary travel and conference attendance looks to factor large in these savings - it's scary to think of some of the spending at these agencies that is done simply to assure "next year's" budget doesn't get cut. What's a bit upsetting is that these agencies needed a near-depression to wake up and find some cost savings. At the Department of Homeland Security, they'll leverage "DHS buying power to obtain high volume discounts for Department-wide usage." Why weren't they ALWAYS doing this? AlphaNinja - US stocks down today, yet pretty flat for the week. China spooked people, with it's stock market index down 5% today. Oil off over $3, not a sign of expected industrial strength... European shares closed positive today, so we'll see which metric the US indexes follow this afternoon. A continued heavy dose of earnings reports dominating the active stocks today, with winners up more than losers down. AlphaNinja - This morning, Yahoo (YHOO) and Microsoft(MSFT) announced their much-anticipated search agreement. Microsoft shares are up 1% and Yahoo shares down 10% (and falling further), as the market had been expecting an "up-front" payment to Yahoo of $500million to $1billion, but was left with none. Well, here we are with the search deal, and she's backpeddling, citing the "boatloads" of "value" as opposed to "cash" or "profits" that the market was hoping for. 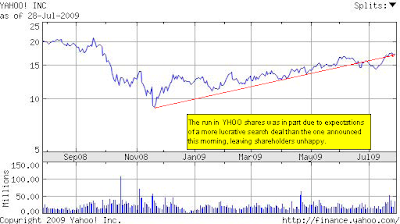 Yahoo shares had nearly doubled of November lows, and this search deal was much of the hype driving that rise. There should be no surprise to see investors selling shares in a major way. 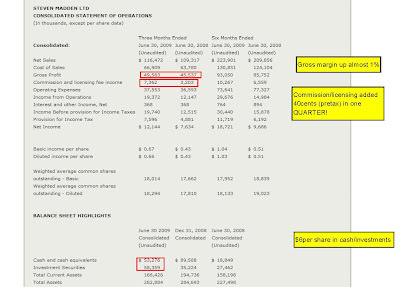 Ok, great -->> $500million operating income is about 23cents per share after tax - adding that to 2010/2011 EPS (earnings per share) estimates gets the estimate to 65-85cents? Yahoo trades at $15.50 right now, a rich multiple to those earnings, and that's why the stock could continue to plummet. As it looks right now, Microsoft has struck an incredibly shrewd deal. We're already getting a US senator out on the wires saying this deal needs "careful scrutiny" -->> What? Google has nearly 70% search market share, Mr. Senator. Where were you then? AlphaNinja - Markets down half a percent in premarket trading. Yahoo (YHOO) and Microsoft (MSFT) agree to a long-awaited 10 year search deal, yet the monetary benefits to Yahoo have some disappointed, sending shares down 7%. US durable goods orders +1.1% - better than expected...excluding cars and planes. "Buying stocks used to be about long-term value, doing your research and finding the company that you thought had good prospects. Maybe it had a product that you liked the look of, or perhaps a solid management team. Increasingly such real value is becoming irrelevant. The contest is now between the machines — and they’re playing games with real businesses and real people. " AlphaNinja - Thanks to strict cost controls, healthcare distributor McKesson (MCK) beat earnings this afternoon, reporting profits of $1.06 per share, versus expectations of 83cents. "In the first quarter, Distribution Solutions gross profit of $954 million improved 2% compared to the first quarter a year ago. The increase in gross profit for the quarter was due primarily to the impact of our agreements with branded pharmaceutical manufacturers and an improved mix of higher-margin products and services, including sales of OneStop Generics, which were up 19% in the quarter, partially offset by lower sell margin in our U.S. pharmaceutical business. Distribution Solutions operating profit of $430 million was up 12% for the quarter and operating margin was 1.66% compared to 1.48% a year ago. “Distribution Solutions had a very strong performance in the first quarter. 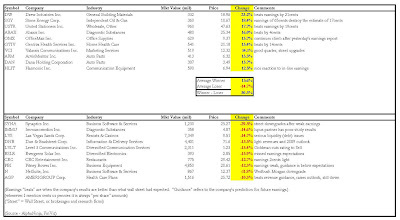 Margin improvements were attributable to several factors, including solid levels of compensation from our agreements with branded pharmaceutical manufacturers, above-market growth for our OneStop Generics program, increased demand related to the H1N1 virus and, most importantly, a more disciplined approach to expense management across all of the businesses in this segment,” said Hammergren." Full year guidance was raised to $4.15-4.30 per share, the midpoint of which assumes that we don't see the same kind of earnings beats in the quarters ahead -->>McKesson might be conservative in its estimates. Using the midpoint of earnings guidance for 2010 implies Free Cash Flow in the $1.2billion range, which is a 12% FCFY on the company's net-of-cash market value. A very nice yield for this company's shares. AlphaNinja - Nearly bankrupt California turned down an energy proposal from Plains Exploration & Production (PXP), that would have increased revenue to the state and advanced the state's (and nation's) "energy independence." PXP wanted to use an EXISTING OIL PLATFORM, but was still rebuffed. I suppose it's hard to expect sanity from the CA State Assembly, which is led by a woman who accused those against tax increases of being "terrorists." Details of the company's rebuffed proposals. -->>Donation of nearly 4,000 acres of PXP coastal land for permanent conservation. 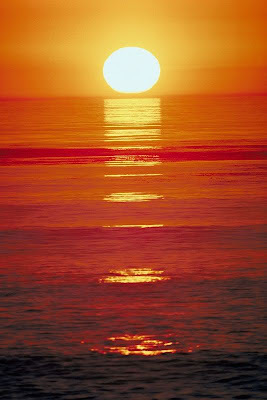 -->>Termination of PXP's existing oil and gas production operations offshore California in 14 years, and removal of all related onshore processing facilities at the end of the project, instead of the company's current 30+ year production/drilling program. -->>Mitigation of the project's greenhouse gas emissions. -->>Economically, to the people of California, the project would provide a $100 million advance to the California General Fund this budget year and as much as $4 billion in royalty revenue over the life of the project. What's more offensive? California's insistence on enjoying the highway/suburb lifestyle while declining to spoil its coastal views to drill for the oil it uses? Or its ignorance in chasing away business in the midst of a budget meltdown? While CA makes it ever-more difficult to do business in this state, other state politicians do all they can to invite business to their states. 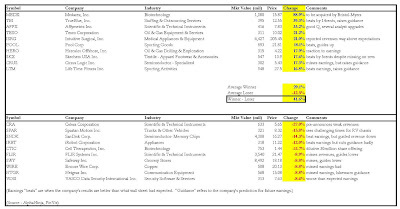 AlphaNinja - US stocks are down, as earnings disappointments outnumbered upside surprises today (though the winners below are helped by SPSS, up on a buyout, not earnings). AlphaNinja - More good news in the M&A space. Following yesterday's "good for all involved" buyout of Varian by Agilent, today IBM(IBM) announced a cash buyout of SPSS (SPSS), for $50, a 43% premium to yesterday's closing price. Far from giving the company away at the lows, SPSS is trading this morning at an all-time high - cheers to management and shareholders. ARMONK, N.Y. and CHICAGO, July 28 /PRNewswire-FirstCall/ -- IBM (NYSE: IBM) and SPSS Inc. (Nasdaq: SPSS - News) today announced that the two companies have entered into a definitive merger agreement for IBM to acquire SPSS, a publicly-held company headquartered in Chicago, in an all cash transaction at a price of $50/share, resulting in a total cash consideration in the merger of approximately $1.2 billion. "With this acquisition, we are extending our capabilities around a new level of analytics that not only provides clients with greater insight -- but true foresight," said Ambuj Goyal, general manager, Information Management. "Predictive analytics can help clients move beyond the 'sense and respond' mode, which can leave blind spots for strategic information in today's fast paced environment -- to 'predict and act' for improved business outcomes." While IBM cites "a total cash consideration in the merger of approximately $1.2 billion," one could say it's closer to $900million, considering SPSS' $311million in cash, or $11 per share. 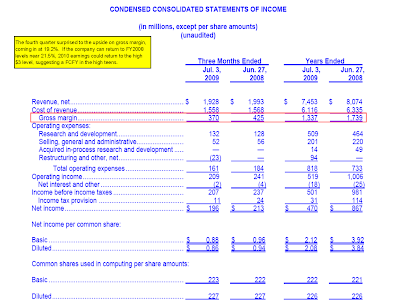 -->> Net of SPSS' cash, IBM is offering 19times 2010 estimate earnings of 1.98, quite a healthy multiple. -->> $50 a share times 19.4million diluted shares outstanding is $970million. Subtract out the $311million in cash and that's $659million. With expected Free Cash Flow of $63million in the next couple years, IBM is paying a 10% FCFY(Free Cash Flow Yield) -->> fair for both sides. AlphaNinja - US Stocks look to open down today as investors tire of the big two-week rally we've seen. The indexes are down about half a percent each in pre-market trading. 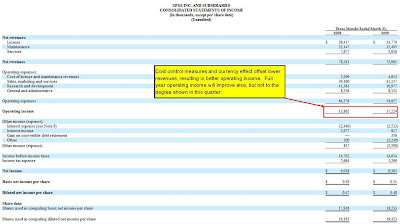 NYTimes suggests a "primer" for new holders of Citigroup stock - US taxpayers. As hedge fund Steel Partners distributes shares to clients who need to sell, the price effect can be huge on some of the more illiuid stocks - opportunity? Newly acceptable in Japan - "hostessing"
AlphaNinja - Varian is leading the winners after their board approved a buyout offer from Agilent. 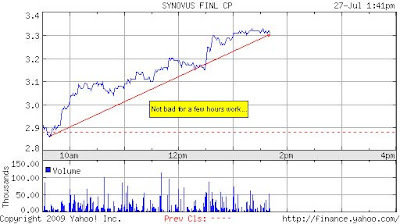 Also up is Synovus Financial (SNV), likely due to excitement from this morning's insider trading activity. SNV director purchased 50,000 shares this morning, and is sitting on a quick 12% gain. nice trade. AlphaNinja - Shell egg producer Cal-Maine (CALM) reported earnings of 43cents per share, far below the consensus estimate of $1.13. 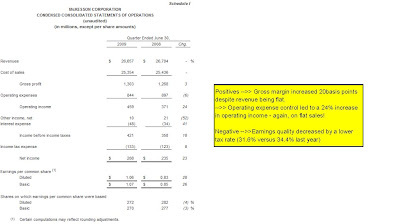 If you took this quarter's earnings as the "run-rate" for the year you'd arrive at 1.72 in earnings, and maybe $45mil in Free Cash Flow, for an FCFY (Free Cash Flow Yield) of 6.5% -->> FAR too low for a company with such volatile earnings. That's a dire view, but worth considering. That volatility in earnings estimates is why I stayed away from shares when writing about the stock in May - not because I didn't like the company, but because I wanted a higher yield to compensate for big risks to earnings. That said, the stock is still up 25% from those levels. I'll update again after talking to management (great management by the way), but am not interested in CALM unless it falls back near $20. AlphaNinja - Varian (VARI) reported non-GAAP earnings of 52cents this morning, ahead of the street consensus of 50cents. "The company has cancelled its previously announced investor conference call to review its third quarter results that was scheduled for Wednesday, July 29, 2009, at 2:00 p.m. Pacific time." The call was canceled, and the earnings of little importance, because five minutes later the company announced they were being acquired by Agilent (A) for $52 in cash per share, a 35% premium to Friday's close. The stock is up 29% to 50.80, just a bit below the offer. -->> About 1.24 times sales, versus its own valuation of 1.48times. -->> About 20times earnings, compared to their valuation of 18.5 times earnings. 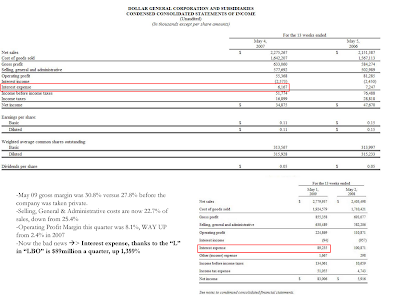 -->> Purchase price leads to a FCFY of 5% yield on the Varian purchase, definitely a positive for VARI shareholders to be paid so nicely...Agilent's FCFY on 2010 earnings estimates is 12% (after netting cash out of the market value). Both boards agreed to the deal, and Agilent is paying a healthy price for the business. Agilent noted that it may take up to 5 years to hit their required 20% ROIC (return on invested capital) on this deal, which makes sense seeing as the FCFY they're paying is 5%. The market likes the deal so far, sending Agilent shares up 1.5% during a down day for the major indexes. AlphaNinja - The house financial services committee is pondering legislation to restrict "naked" CDS trading. CDS, or Credit Default Swaps, allow a holder of a company's debt to hedge against the possibility of the company defaulting on that debt. 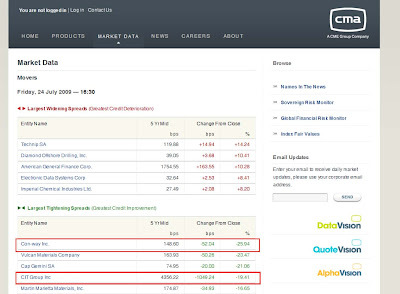 Here's a peek at today's movers in that market, courtesy of CMA Datavision. Basically, if you own $10million of Con-way (CNW) debt, you must pay 148basis points, or $148,000 per year to insure against that default. You can see below that the Conway CDS have dropped in price by 52basis points, and that is because the company had a fabulous earnings report this morning, obviously reducing the chance of default -->> thus, the cost to insure goes down. If you owned the CDS, they'd be losing money today. What congress is concerned about (and frankly I agree), is that people are allowed to buy CDS "naked," meaning they are betting on insolvency when they DON'T own the bonds. Critics of this tactic say that this drives up the CDS price, implying a higher chance of default that in turn becomes a self-fulfilling prophecy (in the case of Lehman Brothers, people bid up the CDS prices, which spooked Lehman's clients, who pulled their accounts, etc etc etc). Defenders of the practice say that these speculators add "liquidity" to the market, and actually HELP the company because people are able to effectively hedge their debt. AlphaNinja - The NYTimes, late to the party, has a great article this morning on HFT, or High Frequency Trading. The stuff is complex and of little use to most investors, but it's a huge part of the market's daily swings, so worth passing along...People are worried that without HFT and PT (Program Trading), the market would be seriously lacking in liquidity. Some of the trading involves front-running other investors, and benefiting from their purchases. But there are literally thousands of strategies being employed that make up for a massive about of the daily stock market volume. "For most of Wall Street’s history, stock trading was fairly straightforward: buyers and sellers gathered on exchange floors and dickered until they struck a deal. Then, in 1998, the Securities and Exchange Commission authorized electronic exchanges to compete with marketplaces like the New York Stock Exchange. The intent was to open markets to anyone with a desktop computer and a fresh idea. But as new marketplaces have emerged, PCs have been unable to compete with Wall Street’s computers. Powerful algorithms — “algos,” in industry parlance — execute millions of orders a second and scan dozens of public and private marketplaces simultaneously. They can spot trends before other investors can blink, changing orders and strategies within milliseconds. High-frequency traders often confound other investors by issuing and then canceling orders almost simultaneously. Loopholes in market rules give high-speed investors an early glance at how others are trading. And their computers can essentially bully slower investors into giving up profits — and then disappear before anyone even knows they were there." Getting a "peek" at orders before the order is shown to everyone? Not fair. I'd expect some uproar over this practice. More straightforward are the thousands of computers hunting for arbitrage situations all day long, and "pairs trading" opportunities like the one example I put together below. 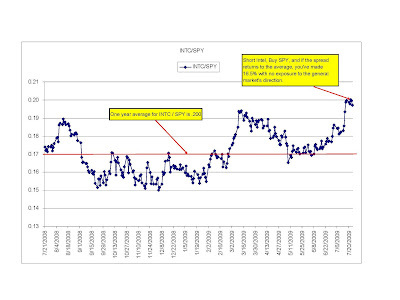 The relationship of INTC and SPY shares changes each day, but over the last year the average has been .2 (.2 times the SPY share price = the INTC stock price)-->> Short INTC and buy SPY when that ratio rises, and you capture the spread as it (hopefully)reverses. The further the spread goes from the average, the larger the profit opportunity. Now picture hundreds of funds doing thousands of these trades daily, sometimes watching for MUCH smaller spreads that can reverse in seconds....Some people are speculating that such trading accounted for almost ALL of Goldman Sachs' recent quarterly profit -YAY CAPITALISM! AlphaNinja - I'm SHOCKED that the market is holding up so well. Microsoft and Amazon were a mess last night, and the market seriously needs a breather (pullback), yet it's only down a bit. You know who's having a really bad day? Folks who bought shares of MEMC Electronics (WFR) after an earnings beat last night, when the shares were at $22.50 in after hours trading. Multiple investment houses downgraded the stock this morning, sending the shares down to 18.33, handing people a 19% trading loss in a matter of hours!!! AlphaNinja - Standpoint Research initiated coverage of Bank of America (BAC) this morning. Standpoint Research initiates BAC with a Hold and price target of $18 saying although there is still some uncertainty surrounding this stock, at 1X tangible book value, the market seems to have discounted a worst-case scenario with regards to commercial real estate exposure and other well-known and documented issues. The firm says financials will have difficulty out-performing the market going forward as they de-leverage and ROE drops from double-digit rates to the new norm. In the coming years, these stocks will probably trade as utilities do, based on dividends, low growth and low multiples on earnings. Firm said they recently ran 840 stocks through our 155-variable computer model and BAC ranked a dismal # 727 out of 840. "There are probably better places to invest." Ummm.... Your price target is 44% above the current stock price. The market has rallied massively, and many people are looking for a short-term pullback, yet there are "better places to invest" than earning 44%???? Nothing at all wrong with Standpoint's research, but typically when your target is 44% higher than the stock, you would rate that a BUY. Deutcshe Bank -->> Almost every business unit missed revenue expectations. "A pause in PC purchases in front of the new OS(operating system) cycle as well as some channel inventory reductions contributed to the results." They believe Windows 7 will be a positive once it launches in October as pent-up demand, opportunities for software upgrades and the positive impact on netbook OS ASPs (average selling prices). 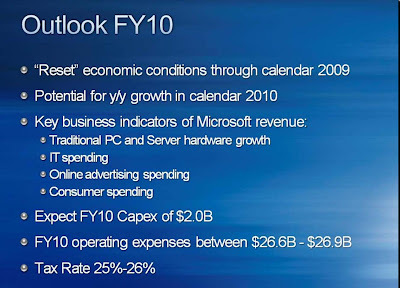 Credit Suisse searches for the positives -->> They think that given Intel's great results, Microsoft will benefit from a "catch-up" in Windows license sales later this year. They believe the company's operating model should show significant leverage once the economy recovers. With the stock off nearly 10% today, Microsoft has a market value of $206billion. Net out the $30billion in cash and that goes to $176billion. 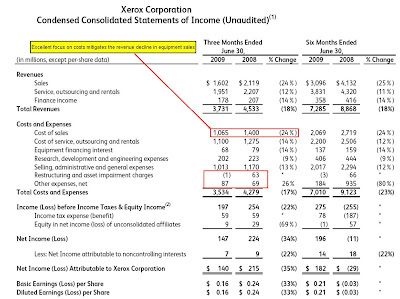 2010 Free Cash Flow looks to be about $17billion, a FCFY of 10%. That's a handsome yield, and it compensates investors for the risks with owning the shares. AlphaNinja - Microsoft(MSFT) reported revenue of $13.1billion for the quarter, a significant miss considering the street expected $14.37billion, and the shares are trading down 8%. Amazon (AMZN) is down 5% in premarket trading, while earnings were in line with expectations. Both stocks have had big runs lately, so they needed stellar reports to keep those gains. Didn't happen. The major indexes are trading down about half a percent premarket, not too bad considering the earnings disappointments I mentioned. After rebuffing a Warren Buffet lowball bid to purchase parts of CIT, the company may be headed towards bankruptcy. A diamond is forever...But DeBeers saw sales of rough diamonds fall 57% in the first half of the year. Liverpudlians furious at the ownership, who is having trouble renewing credit lines. 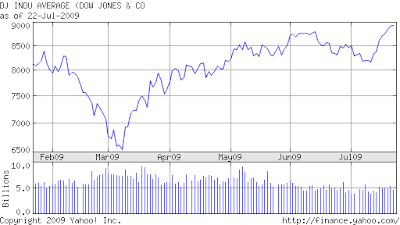 Yes, this really is the title - "California Pension Fund Hopes Riskier Bets Will Restore Its Health"
Another absurd title - "Britain’s Economy Shrinks More Than Expected but at Slower Pace "
Back on April 30th, the weighted DJIA Price to Earnings was 12.2, yet after this 40% run in the index the P/E has only crept up to 12.85 (based on 2010 earnings). 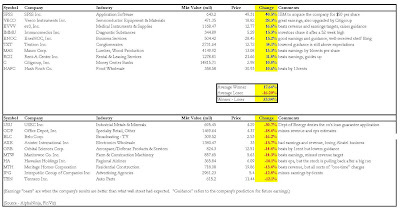 The shifting weightings and help from Cisco and Travelers (added when GM and Citi were kicked out) are part of it, but so too are increased earnings estimates. The average DJIA stock's eps(earnings per share) estimate has crept up .6% since 4/30/09, but exclude the bottom four stocks (BAC, PFE, GE, AA) that only account for 4% of the index and the estimates have risen 2%. Not huge, but important. When earnings estimates stop being revised down and turn higher, the PE multiple investors will pay for a stock often rises. My favorite metric, FCFY (Free Cash Flow Yield), is an estimated 8.5% for the average DJIA stock, down from 10% or so a few months back. Most of these companies can access debt for much cheaper than 8.5%, so I see room for this yield to be lower -->> meaning the shares can trade higher. The dividend yield is a healthy 3% for the DJIA - although down from 3.5% a few months ago, because dividends are not at volatile as earnings estimates. Some of the DJIA stocks have extremely depressed earnings estimates, which could rebound sharply. Cost cutting during this recession could also lead to higher margins (yet lower employment) as we exit it. I definitely have a negative view of the economy going forward, but the DJIA could add another 1500 points and still offer a nice Free Cash Flow Yield. AlphaNinja - Rumors flying around that Carlos Slim, the (occasional) World's Second Richest man, may offer to buy Saks (SKS). Significant debt is maturing in 2010 and 2011. Fortunately for Saks, the debt covenants are very lenient. Best of luck to Carlos, and I hope things turn out better than they did with one of his other retail experiences, Circuit City -->> he offered to buy the company for $1.6billion in 2003. That didn't happen, yet he still rode shares down to zero. AlphaNinja - If the Nasdaq closes positive today, it will be 12days in a row...The longest streak since 1992. Nucking Futs. The Dow Jones Industrial Avergae is above 9,000 this morning, after bottoming (not sayin' that was THE bottom...) at 6500ish in March. As I'll detail later today, even after this big run the index is not very expensive. Thanks to Bristol-Myers' shall we say "aggresive" (I think a 90% premium to the previous close indicates they want to avoid a bidding war...) bid for Medarex (MEDX), top 10 gainers are beating losers by 42% -->>I've never seen such a disparity. AlphaNinja - With an over-abundance of predictions from market pundits, politicians and economists over the length and depth of this downturn, we can find better indications from companies on the front lines. UPS and Xerox results show that the business environment is still terrible, but the decline has slowed. Neither are in a position to call the bottom yet. Xerox (XRX) shares are up 7% this morning after the company reported mixed results. Mixed in that earnings beat expectations, but guidance for next quarter is below what people were looking for. -->> Guidance for q3 EPS of 11-12cents is below the expected 14cents. Most important in terms of what this says about the economy is that this quarter did NOT show an acceleration to the downside -->> the sales decline for this 3month period was not worse than the six months combined that just ended. Maybe things are bottoming, maybe not, but Xerox is managing quite well in this environment. 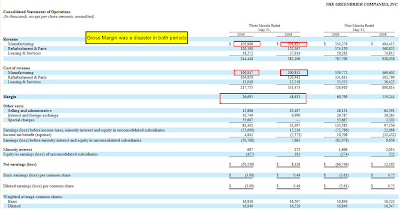 Taking their guidance of $1.5billion for cash from operations and subtracting $200million for CAPEX, the company may earn $1.3billion in Free Cash Flow, which is a FCFY (Free Cash Flow Yield) of 20% -->> HUGE yield, but it's that rich because of the big debt load the company carries. UPS reported this morning, and it isn't pretty. Both volume and pricing were down, dropping operating margin to 7% from 11.7%. The stock is up on the day however, as investors were not expecting much from this quarter. Interestingly, while ground volume was down 5.4% in the US, air volume was actually flat. International package revenue is only 1/3 the size of domestic, but it had a much better performance thanks to a focus on costs. -->> Consolidated revenue was $10.8 billion compared to $13.0 billion for the prior-year quarter, while consolidated volume was 914 million packages, down 4.7%. “The economic environment continues to be difficult. Declines in both our domestic and international businesses appear to be stabilizing but volumes will remain significantly below last year’s levels,” said Kurt Kuehn, UPS’s chief financial officer. Although declines in economic indicators are less dramatic than earlier in the year, questions remain as to when business activity will begin to strengthen,” he continued. “The business environment in the third quarter should be similar to the second quarter. As a result, we are providing the same guidance as we did for the second quarter – earnings per share within a range of $0.45 to 0.55." Unfortunately, that guidance is below the street expectation of 59cents. I'm impressed the stock is holding up so well this morning. People may be betting that the guidance is conservative, and that UPS will beat it handily if they cut costs. AlphaNinja - US markets are poised to open higher despite worse than expected unemployment claims. Offsetting that is positive earnings from Ebay (EBAY) and renewed dealmaking - Bristol-Myers Squibb (BMY) is buying Medarex Inc.(MEDX) for about $2.1 billion in cash, a 90% premium to yesrterday's closing price. Amazon (AMZN) will buy online shoeseller zappos.com for $850million. Despite the popularity of Amazon's Kindle, e-books give readers less legal rights to share them than a traditional paperback. NYTimes on some of the more unpleasant practices in the cellphone industry. Delphi's pension bailout will cost $6.2billion, the 2nd largest largest pension rescue ever. HUGE ambitions for AOL's "next phase." The administration suggests some sort of murky "fees" on "far-out transactions." "So if you guys want to do them, then you got to put something into the kitty to make sure that if you screw up, it's not taxpayer dollars that have to pay for it," Mr. Obama said in response to a question at a press conference. "It's dollars coming out of your profits." 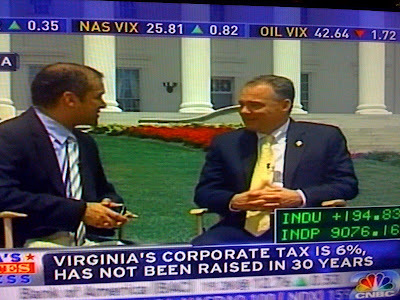 -->> And all along I thought "dollars coming out of your profits" were "taxes." Porsche CEO Wendelin Wiedeking steps down, as the company will soon be taken over by VW. While Goldman's increased risk lead to massive trading profits, Morgan Stanley's caution killed them. AlphaNinja - Rate-comparison company Bankrate (RATE) has agreed to be acquired for $28.50 by Apex Partners. 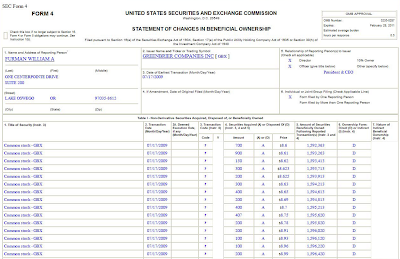 IMPORTANT -->> former CEO Peter Morse, who owns almost 4million shares, is likely part of the buyout group. Remember the risk you run with company stock concentrated in the hands of management. This guy thinks the company is worth more privately run rather than publicly, and he's running off with the company. This stock has been the bain of existence for shortsellers for over half a decade, and I give the company credit for proving them wrong. 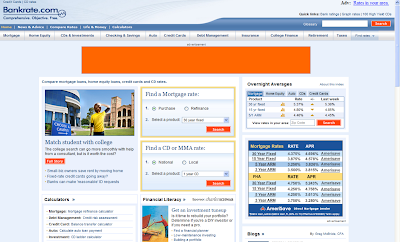 People could NOT grasp the idea of Bankrate's portfolio of websites being a defensible operation -->> sadly for the short-sellers, Bankrate's capitulation (selling itself) may be the proof to their argument. The stock is up 16% to 28.65 -->> above the offer price, as shorts get squeezed and others bet on the possibility of a higher offer. In a sign of the times, this is a BO(buyout) not an LBO (leveraged buyout), as no debt is being used. "Under the terms of the agreement, Apax will commence a tender offer to acquire all of the outstanding common stock of Bankrate, for $28.50 per share in cash, followed by a merger to acquire all remaining outstanding Bankrate shares at the same price paid in the tender offer. The offer price represents a premium of 15.8% over yesterday's closing stock price and 18.2% over the average closing price for the previous ten trading days. The transaction is valued at approximately $571 million. Apax is providing 100% of the financing for the acquisition from its equity funds under management. Shareholders representing approximately 24% of Bankrate's outstanding shares have entered into support agreements with Apax in connection with the transaction." AlphaNinja - I noted some of the details of the Yahoo and Starbucks earnings last night. Yahoo is flat on the day after trading down last night and this morning, possibly due to confusion over guidance. Starbucks is up, as people are looking WAY beyond this year's earnings when valuing the stock. Jeffries worries about the "quality of those earnings." Yahoo - seriously, I think I'm right, and these (admittedly murky) guidance was not as bad as people thought. It's up 3.2% right now, 7% off it's morning low. -->>Jeffries liked the quarterly results, with EBITDA above their estimates. They see the guidance as low due to hiring initiatives this coming quarter. Interestingly, they "see YHOO's positive front page redesign as complementary to MSFT's early success with Bing, and conducive to a partnership." -->> William Blair saw last night's results as "mixed," with revenue per search declining. Starbucks (SBUX) results were ahead by a few pennies, and the street is atizzy, sending shares 18% higher! 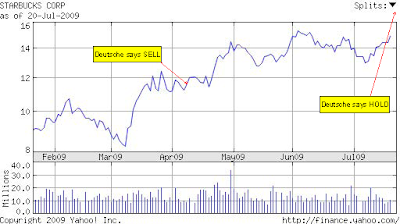 -->>Deutsche raises their opinion to Hold from Sell and takes the target to $14 from $9. They cite "materially better cost management." They worry about McDonalds competition, as well as the danger of peddling "affordable luxuries" in this environment. -->>Argus upgrades to Buy and takes their target to $20, as they like the slowing store expansion (helps cash flow), better expense management, and focused programs that should drive traffic. They expect other investors to "bid up" the shares on anticipation of improves same-store-sales. -->>Jeffries, maybe the more awake of the bunch, notes that earnings were helped by a 2cent benefit from cost cuts and 2cents from a lower tax rate. (Nothing wrong with cost cuts guys, take it easy!). They see the cost cuts as "buying time" until sales recover. AlphaNinja - No I didn't come up with that, Paul Howard did, writing for City Journal. If anything, it's a reminder that despite what we or our politicians think, our ability to "control" outcomes is still limited. Preventing disease is praiseworthy, but it may not reduce health-care costs. "William Osler, a renowned nineteenth-century doctor and the first physician-in-chief at Johns Hopkins Hospital, once remarked, “Pneumonia may well be called the friend of the aged. Taken off by it in an acute, short, not often painful illness, the old man escapes the ‘cold gradations of decay,’ so distressing to himself and to his friends.” If Osler were alive today, he might call pneumonia the friend of Medicare accountants, since it kills victims quickly, in contrast with the lingering and expensive chronic illnesses that account for about three-quarters of all Medicare spending." AlphaNinja - US stocks pretty flat this morning. Starbucks (SBUX) shares are up 15% on a strong earnings report. Greenbrier (GBX) CEO William Furman bought shares last week, giving a significant boost to the stock. "Earlier this year, General Electric Railcar Services Corporation ("GE") advised us of their desire to substantially reduce, delay or otherwise cancel deliveries under a multi-year contract to build 11,900 tank cars and covered hopper cars over an eight-year period, with a current value of $1.0 billion. We are currently in discussions with GE. We believe GE is in breach of its obligations under our contract. GE has recently instructed us to slow our production of railcars to a rate of production less than that required under our agreement and does not allow for efficient operations of our manufacturing facility, also as required under our agreement. GE has also unilaterally begun reducing the number of railcars they are willing to accept for delivery despite the fact they have inspected and approved the railcars as conforming to the specifications." Greenbrier received a capital "injection" of $75million from WL Ross a while back, helping its financial position through this downturn. Actually a pretty interesting financing, the loan has no debt covenants, though WL Ross gets 3.4million warrants....pretty hefty dilution. "The new secured term loan provided by WL Ross contains a feature by which Greenbrier and WL Ross may jointly agree on conditions to increase the loan to $150 million. The initial $75 million investment is in the form of a three-year, non-amortizing, term loan with no financial covenants and a favorable interest rate of LIBOR plus 350 basis points. In connection with the loan, Greenbrier has issued warrants to purchase approximately 3.378 million of Greenbrier's common shares, representing 16.5 percent of Greenbrier's common shares on a proforma basis, at $6.00 per share. WL Ross also plans to purchase, at a minimum, $1.5 million of Greenbrier common stock in the open market and will be subject to certain transfer and hedging restrictions associated with the warrants. The Company's Stockholder Rights Agreement has been amended to allow WL Ross and its affiliates to acquire the warrants and purchase shares, provided that if their ownership exceeds 19.9% of the Company's voting stock, the additional shares will be subject to a voting agreement." 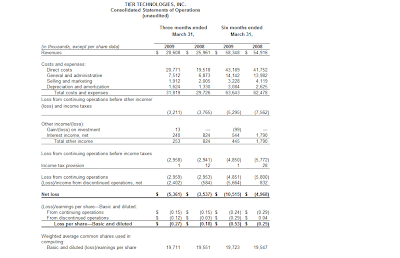 Tier Technologies (TIER) CEO bought 20,000 shares on the 14th of this month. The Virginia based electronic payment systems company has been restructuring lately, and hopefully this positive buying signal from management is on target.